Weebly is a web-hosting service featuring a drag-and-drop website builder. It is very easy to understand and user-friendly to build a website using its drag and drop feature. It provides many themes and tools to build a website. Most of the startups choose weebly for their work because it is extremely simple and easy to use. Also it does not demand for more technical knowledge and provides reliable drag and drop options which easy to understand and use. As these startup grows to big business, they face problem due to limitations of the weebly platform. And therefore, they decide to move on to something more powerful and flexible and also do not have much limitatons. Many of these businesses chooses WordPress as the alternative to their weebly as it is also very easy to understand and use. WordPress is more powerful than weebly in many aspects and do not have much limitations. Drag & Drop: Weebly comes with beautiful themes and with default drag and drop feature whereas for WordPress, though there are many free themes present in WordPress Theme Directory, but the drag and drop option is not available by default. You can however use many of the available drag and drop plugins which can provide similar functionality as the drag and drop feature available in weebly. Also this feature will be made default in the new Gutenberg editor in the future WordPress updates. While Weebly does allow you to setup an online store, but it gives very basic features and there are a lot of limitations to the customization of the store. Also there is a transaction fee for every sale. Whereas, in WordPress, there are many free and premium plugins available to build an online store such as WooCommerce, WP eCommerce,etc. You can add coupons, customize receipts,etc using these plugins. Also, there is no transaction cost associated with them. 2. Themes : Although, WordPress is loaded with number of themes and themes are available for all purposes but weebly provides small businesses a good looking themes. Weebly’s themes are much more limited than WordPress but it provides a good-looking site right out of the box. Also there is no way to migrate theme, so, to get the same look and feel you need to have a look at available themes for WordPress. You can also recreate the theme using a flexible theme like Divi. 1. Purchase Hosting : If you are moving from weebly to WordPress, you need hosting. WordPress hosting is widely available, with options ranging from inexpensive shared hosting to specialized managed hosting. Specialized hosts provides security, backups, WordPress updates, and performance features. Specialized hosts typically cost higher than those of shared ones but this cost worth the price to protect your site. 2. Set up temporary domain : Until the migration process is complete, you can setup a temporary domain for your WordPress site. After the migration is completed you can switch the domain to the new site and change the urls of all the pages and posts accordingly. 3. Install WordPress on Temporary Domain : Now, you need to install WordPress on your temporary domain. 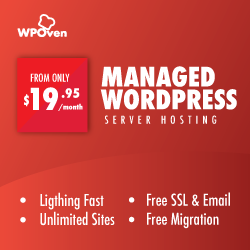 If you host with Managed hosts like WPOven or alike, the hosting provider will install WordPress on the domain by default. Otherwise, you would have to install WordPress manually as mentioned on the wordpress.org site. You can follow the steps and get it done within a few minutes. If you prefer to install the WordPress on the domain manually, then follow this guide “How to install WordPress manually“. The simplest way to migrate the site from weebly to WordPress is simply copy the content from weebly and paste it to WordPress as in any text editor. The benefit of moving the site manually is that you will be sure that every piece of content is migrated to new WordPress site. This is a very good way to copy the site from weebly to WordPress. We recommend this method if you have a small site (i.e less than 25 posts and pages). The disadvantage of this method is that it can be slow and time consuming if you have a large site. If your site is small and you plan to migrate it manually then this is the first step i.e create the pages and posts which you want in the new WordPress site. This will speed up the copying and pasting process. You can create pages and posts manually in going to ‘Add new’ menu under posts and pages individually in WordPress admin dashboard. This may take time, you can also opt for bulk creation by installing Bulk Page Creator or Quick Bulk Post & Page Creator plugin. Once the pages and posts, which are needed, are created. Copy the content of the pages and posts manually from weebly and paste it on the pages or posts of the WordPress. The media files must also be moved manually. What you have to do is just save the media and then upload the media on the corresponding page or post manually. Also, you need to fix the internal links of the images so that it must point to the pages within your WordPress page. It ensures that every piece of code is migrated. It allows you to review your content throughout the process. For the larger sites (having more than 500 posts or pages), the manual migration is simply not feasible. It requires a large amount of time. If your site is bigger i.e it contains more than 25 posts and pages or you do not have much time to migrate the site or do not want to waste much time on migration process then you can opt for this process. The automated option is the second best option for migration available. Like many other web platform, weebly offers RSS feed for the blog that we can use to help automate the process of migrating our blog posts. When the RSS button is clicked on the weebly site, feed is opened as a XML file in the browser with the URL as “www.testsite.com/1/feed/” or “www.testsite.com/blog-page/feed/”. Save this file on the system. We can not use the default importer to import the weebly feed. In order to import the weebly feed we can use the tools like, WP All Import or ImportWP to import from the XML feed file into WordPress, which will enable us to map the fields in the feed to WordPress posts. Unfortunately, weebly does not provide feeds for the pages and hence you have to export entire site. But before exporting the entire site from weebly consider backing up your site. You will get the HTML for all your pages on your websites. If above method does not worked for you, then you can use this method to export posts also. Once the export process is done, save the HTML on the system and then you can import the data using the plugin HTML Import. However, HTML Import plugin imports the images and other media as well. But check for the incorrectly linked images or any other file. You can manually fix it or can use the plugins like Import External Images, Import External Attachments to fix it. This process works perfectly well with large amount of content. It is faster than the manual migration. It is done by machine so it needs to be checked. Some data might not be able to migrate. There are many services available online which provides the migration from one cms to another cms as a service. Best example of this type of service is cms2cms service. They provide the paid service to migrate your website from one cms to another cms. 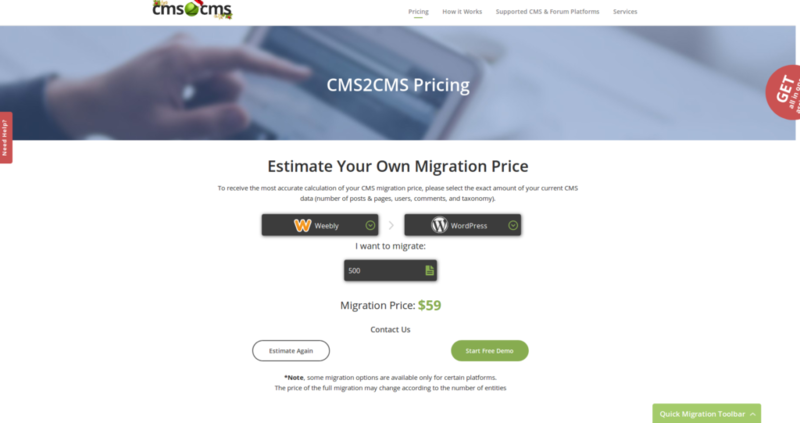 You can also get the estimate of your service before hand at www.cms2cms.com/pricing/. You also get the demo migration which you can test. If you do not want to spend any of the time in migrating the website or you are having trouble in migrating your website from weebly to WordPress then you can opt this as it is also a good option. The migration process is now completed. To get ready with your site you need to set up few things so that WordPress site becomes ready. There are few steps left which must be followed to complete up the WordPress site. 1. Choose the theme for the website : As discussed above, weebly provides a number of themes but it is not possible to get the same theme on WordPress. Therefore, the theme must be chosen for the website and, if needed, customize it.You can customize the theme using Divi theme. 2. Setup all other features : Now you can add functionalities to the site like forms, seo, etc. You can also add widgets to the site. Customize the site as per your needs. 3. Test the Site : As the website is nearly ready, you can check all the functionality of the site. Also check whether all the pages and posts are migrated by automated migration and every media is linked correctly or not. To check the broken links you can use Broken Link Checker to scan all of your pages and posts and notify you about the broken links in the pages or posts. Once the testing is completed and the domain transfer is also done, it is time to updated the WordPress site to use the domain name. Firstly, change the General settings and change the home url and site url from temporary domain to live one. In order to change the url of every page and posts you may use some search and replace plugins like Better Search and Replace or Real time Search and Replace. In plugins, simply enter the old URL and the Domain name with which it needs to be changed with. Do craete a backup of the database before doing any changes to it.